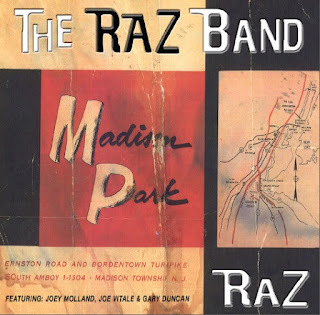 MuzikMan's Reviews And News: Rock Legends “The R​AZ​ Band​” Releases New Album Featuring Badfinger's Joey Molland and Drum Legend Joe Vitale! ​The catalyst that led to the Madison Park album was a ​RAZ ​show​ at The Whisky​ A Go Go​ in Hollywood. Their guest performers were Joey Molland,(Badfinger), Gary Duncan,(Quicksilver Messenger Service) & Carla Olson, (The Textones). Raz​ recalls​, “Whenever Joey Molland ​came to​ LA we ​would ​record​​ RAZ songs. This time we recorded Joey's great song, 'Love Me Do' from the amazing Badfinger album 'No Dice'. To add to the fun, Gary Duncan was able to join us for this ​recording ​session. ​”When ​Joe Vitale ​came ​back​ to ​LA, ​​ RAZ ​went​ into the studio to record. “We recorded a new song that we wrote, '$1.50 For Your Love'. ​​After cutting the back tracks with scratch vocals, Vitale said, 'This song is a hit song, and let me tell you, I know what a hit song is'. And of course he does, he co-wrote 'Rocky Mountain Way' with Joe Walsh. “A couple days later we ​went​ back into the studio with Vitale and recorded another one of our favorite songs, 'Shoot 'Em Up'. This is from Joe Vitale's great album, 'Roller Coaster Weekend'. “Let me tell ya, some good stuff here. I really enjoy RAZ!” - Kelly Cox, KLOX 95.5 FM L.A.